Step 1: Go to Prompt Web Hosting website. Click the Client Login button on the top right. Step 2: In the Menu options click Support -> Unblock IP address. 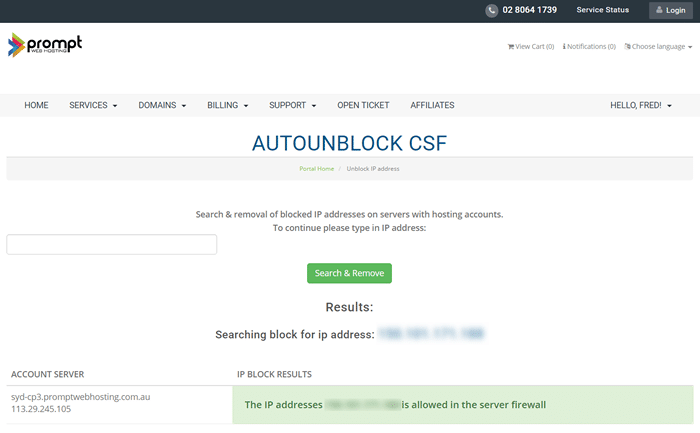 Step 3: Your current IP address will be automatically displayed for you to remove the block on your IP address. Otherwise to search for another IP address, enter it into the search box then click on the Search & Remove button. Step 4: After the process is complete you should be able to resume regular browsing of your website. How can I access my cPanel account?